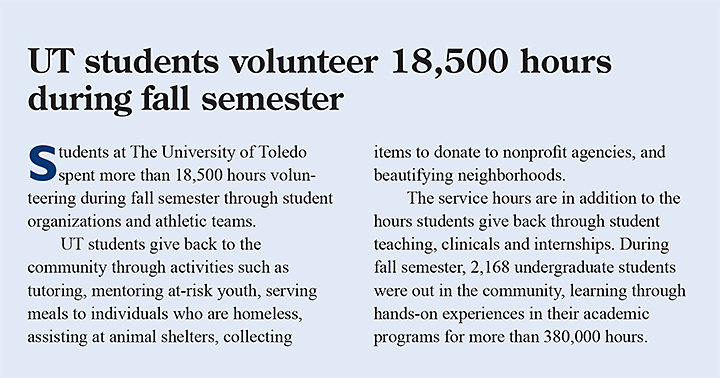 The University of Toledo has released its initial annual engagement report to highlight the impact UT has on the community through the efforts of students, faculty, staff and alumni. The report is the first of an annual effort to document the University’s community engagement activities as part of an initiative launched last academic year to enhance opportunities for partnership and collaboration. 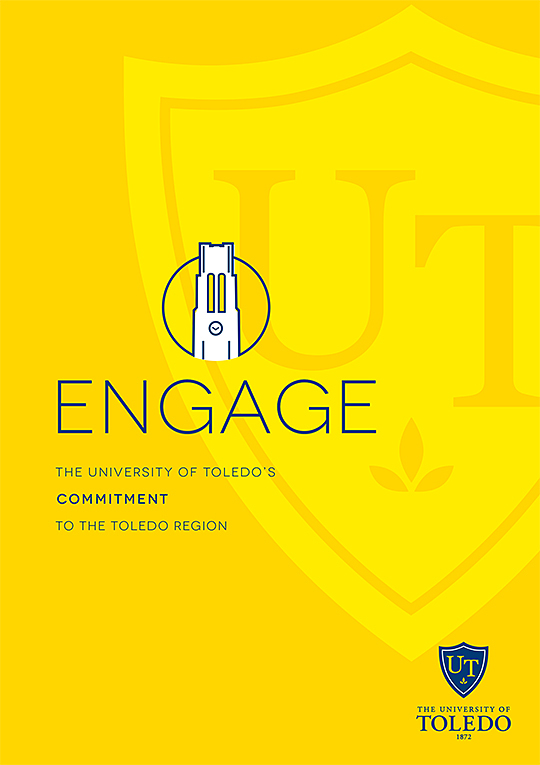 The 2018 Annual Report on The University of Toledo’s Community Engagement, available on the Community Engagement website, organizes UT’s engagement activities through the lenses of talent development, innovation and place. In the area of talent development, the University took a look at its academic and experiential learning programs that prepare students with the strong educational foundation needed to succeed in the workplace. At the same time, UT provides area businesses with a strong pool of interns and employees to help advance their operations. One example of UT’s impact — 78 percent of the 2017 College of Business and Innovation graduates found employment in the northwest Ohio and southeast Michigan communities. UT’s business incubation efforts are highlighted in the innovation section, noting that since the inception of the LaunchPad incubation program in 2014, there have been more than 250 entrepreneurs served, nearly 250 jobs created, and nearly $30,000,000 in sales revenue and professional investment in the region. Lastly, the report looks at the University’s role in improving the quality of life in the place it calls home. The CommunityCare Clinic run by students in the UT College of Medicine and Life Sciences served nearly 5,000 patients last year, and all UT students collectively performed nearly 40,000 hours of community service, volunteering their time beyond the hours they give back through student teaching, clinicals and unpaid internships. This entry was posted on Friday, February 1st, 2019 at 3:25 am and is filed under Medicine and Life Sciences, News, UToday .